This article completes our three part blog series on our newest architectural style, The Moderns™. In part one, we shared the inspiration for the series as well as some practical tips on location and consideration. In part two, we delved into the largest of the floor plan concepts, the Newport, as well as the Wright, named for the iconic architect of Fallingwater fame, Frank Lloyd Wright. Today’s final installment in the series introduces you to the Madrona and Tacoma design concepts and highlights the best points of each. 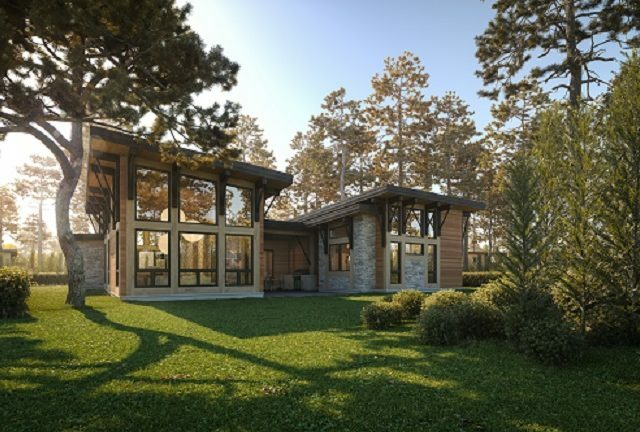 Each of the custom homes in The Moderns™ collection showcases design elements that seamlessly blend Riverbend’s timber framing with modern architectural styling. Exterior timber bents support extended roofs, while interior timbers structural support open shared spaces where light floods in from large windows. Read on to find yourself inspired by the stunning modern design of this style of timber frame home. Read part one here. Missed part two about the Wright and the Newport? Go here. The smallest design footprint in The Moderns™ collection is the Madrona. This home concept was named after the Pacific madrona, a sturdy, evergreen tree with dark, shiny leaves[i] that grow into a surprisingly delicate canopy. 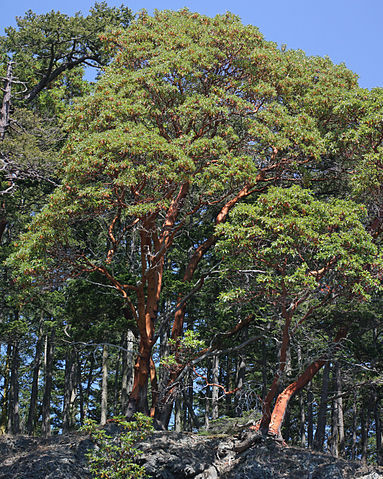 Pacific madronas bring a bonsai feel to a landscape, and are beloved for their exotic look in regions typically brimming with needled conifers. In addition to its lace-like canopy of leaves, another unexpected gift from the madrona tree is that each spring it bears small, white, bell-shaped flowers. It is the tree’s ability to delight the eye in unexpected ways that assured the Riverbend team it was the perfect name for their floor plan concept. This is because the Madrona design has a few charming surprises of its own. One unexpected feature of the Madrona is that its master suite is completely separated from the rest of the home. This includes a private covered patio. Another surprise is the home’s charmingly diminutive loft, perfect for a child’s hide-a-way–or your own! Now that you are more familiar with The Moderns™ collection, it will come as no surprise to you that the Madrona’s interior is flooded with natural light. 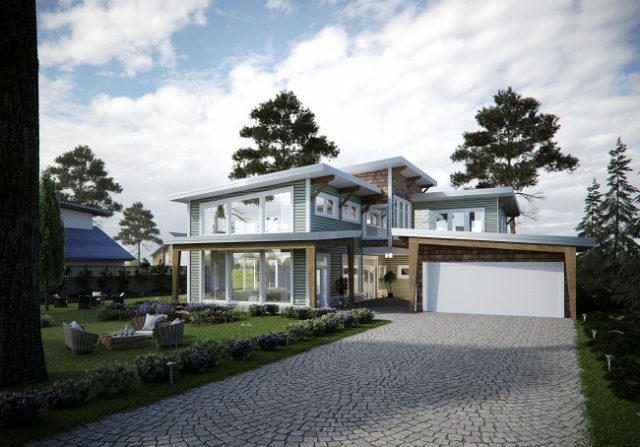 And, as a Riverbend design, of course the modern-styling is accented by a beautiful timber frame. In-keeping with the modern design stalwart element of melding the outdoors with the interiors, the Madrona offers several easily-accessible patios that expand the home’s living spaces to the outside. View the Madrona’s floor plan concept and elevations here. Interested in seeing your home before you build? Read about achieving the “Perfect Plan” here. Our Tacoma design is the only concept in The Moderns™ series that has a large amount of liveable space on its second level. The Tacoma’s conceptual plan offers over 1,200 square feet upstairs. (Compare this to the Newport’s second level of approximately 750 square feet, for example.) And, unlike the Newport’s second-level master suite, the Tacoma is designed with a main level master suite, making it a popular choice for timber frame aficionados who have mobility issues or desire to age-in-place. This first-floor master suite offers solitude when you need it and easy access to your private courtyard and patio. The Tacoma Modern Home Concept from The Moderns™ Series by Riverbend. Windows and timber accents make the Tacoma’s large spaces warm and inviting. Entertaining groups of guests, large or small, is easily accommodated on the main floor while the expansive upstairs media room is the perfect a gathering place for the kids. And, as the day wanes, you are sure to spend a cozy evening gathered around the fireplace in your courtyard exchanging stories with family and friends. Though there exists both Australian and American cities named Tacoma, there is also a ferry, a class of United States Navy ships, and even a moth that share this beautiful name. It is Riverbend’s Tacoma design, however, that we think you are most likely to remember. See the conceptual floor plan and elevations here. While all the homes in The Moderns™ series are conceptually designed for review, there is an element missing – YOU. Through the Total Home Solution™ process, Riverbend will guide you through all the stages of building your new modern timber home. During this process, Riverbend designers will customize your selected floor plan to your unique needs and work with you on home placement to take best advantage of your land. Once the design process is complete, your Riverbend project manager will coordinate your timber project starting with the fabrication of your timber frame, providing a seamless transition from design to manufacturing and finished construction. The Riverbend team can coordinate your home’s construction with your selected builder, help you find a builder, or manage the entire construction of your home. Click here to learn more about our construction solutions.